Small yards in Chesterfield and Richmond can make it challenging to chose the proper sized landscaping. How many homes have you seen that have been swallowed by the trees and bushes that were planted when the house was built or how many homes do not have any landscaping to speak of. Landscaping should add value to your home and not take away from its beauty. You don’t have to be fearful to plant a tree or bush for fear of the upkeep. There are plenty of good choices that are low maintenance and small enough that they won’t take over your small lot. Here’s a list of small decorative trees that you can plant this fall that will be sure to beautify your Chesterfield home. 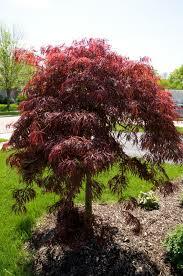 Japanese Maple – These compact trees are a popular choice based as they come in may shapes, sizes and colors. They can be trained and pruned to look sculptural if that’s your desire. We recently cleaned and stained a multi-level deck and prominently featured was a Japanese Maple. The homeowner was concerned about harsh chemicals coming in contact with the tree and loved that our cleaning products would do no harm to his beloved tree and surrounding landscape. Dogwoods – Dogwoods are native to Virginia and again are popular due to their small size and numerous varieties. Dogwoods are wonderful as they bloom in early spring signaling that Spring has come. We planted several varieties in our yard. We have white, yellow, pink, variegated and dwarf varieties. They line our driveway and are in our flower beds. They are so versatile! Plum – This wonder is great to add interest as it is red in color and produces pink blooms in the spring. It will grow larger than the previous two types, however, it stays compact and is great in the full sun. You can buy flowering varieties or fruit producing varieties. Saucer Magnolia – One of my favorites! It offers some of the most beautiful flowers of any tree. It produces large blooms in shades of white, pink, and purple in mid- to late spring. This one grows up to 20 feet. Mountain Stewartia – This one is not common in our parts yet I found it should be. 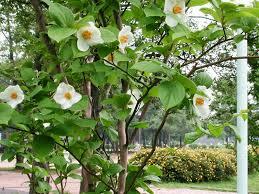 It is a small tree with white and orange flowers. It blooms in midsummer and in the fall the foliage changes to a beautiful orange / red.